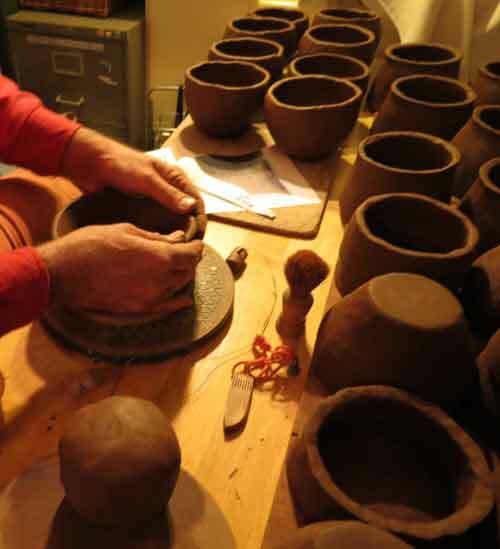 In 2014 Bill made some replica Neolithic bowls for Somerset Museum service, following on from his beaker making which is detailed below. Here is a closer photograph of a bowl that has been made and not yet fired. The bowls will be used for children to handle and so they need to be reasonably robust, so they have been made using commercially prepared earthernware clay. But this has been made more authentic by the addition of ground up flint grit to copy the orginals. Flint waste from knapping operations was heated up (in a biscuit tin to avoid the exploding pieces causing any damage!) to about 900C - that fractured the flint and made it easier to smash up and grind into sand-sized pieces, the pre-heating also makes the broken flint less sharply edged. A couple of kg of flint were added to 25kg of clay, so about 10%, which is about the smallest proportion found. 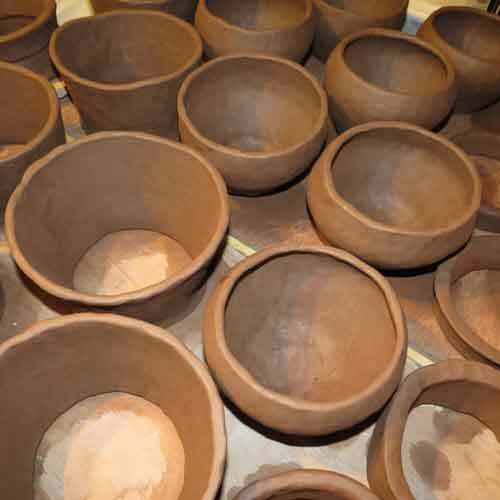 In the same way as the beakers shown below, the bowls were made by pinching the soft clay into base pieces and rims and then waiting for it to dry and stiffen up a bit before being joined together. 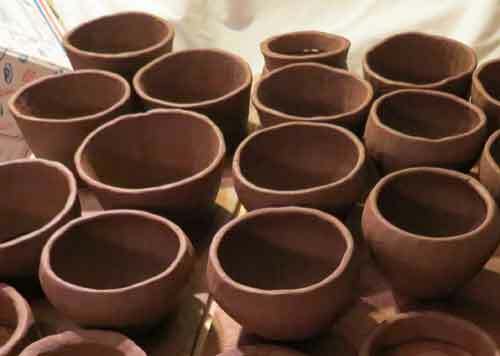 The bowls were then pinched and beaten with pebbles to thin them out some more, although they have been kept heavier than most of the replicas Bill makes. The "maggot" decoration was made by pressing in pieces of rope, which needs the clay to be soft enough to take an impression but stiff enough to hold its shape. The term maggot describes the appearance of the line of dents. The rope is twisted so that a central core is wound round with a tight spiral of cord to form the required shape. 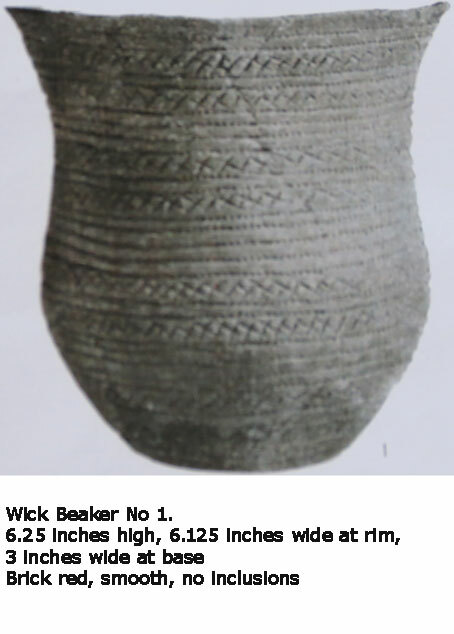 Over the winter of 2012/13, Bill was been commissioned by Somerset County Council Museum Service to produce 7 sets of the 3 beakers found in the early nineteen hundreds in the Wick Barrow, near Hincley Point in north Somerset. This page gives details of the project as it unfolded, starting with the research information provided by the client. An extract from the original report on the excavation is reproduced below, together with the photographs produced in that report. This is a modern photograph of the three beakers. These are the images of the beakers taken from the report, prepared at 10% oversize and printed on card so that a template can be cut to check the profile of the shape while being made and the impressed decoration can be copied. 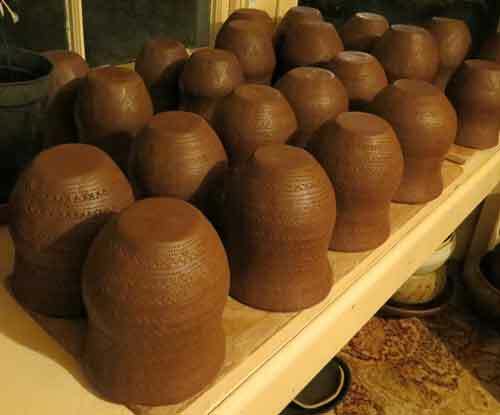 These are the beakers under construction - in the forground are the No.2 beakers, joined and drying out before being smoothed and decorated. These are the No 3 beaker sections, with bowl bases and fluted top sections at the upper left. They have been pinched out into the correct size and shape (using a card template to check profile), and are drying so they stiffen up and will not distort too much as they are being joined together. This shows the inside of the top sections on the left, the base in the middle and a shorter middle section on the right. These will be joined using a "tongued and grooved" join, where the top of the lower part is pinched into a thinner rim that fits inside a groove pinched round the base of the upper section. That complex join is far stronger than a simple one on top of the other join, it also helps to locate the sections concentrically and pressure can be applied across the joint - which ensures they are firmly squeezed together. This No 3 beaker is just too high to make in two pieces, as the joint has to be reached by finger and thumb on one hand, which limits the height of the section. This shows a section being pinched out into shape from a ball into a bowl. The piece of clay is slowly rotated and compressed evenly all the way round, thinning the wall and increasing the diameter and height. Sometimes the piece is "strangled" to compress it into a smaller diameter, so that it fits the template size and shape. These are most of the beakers, finished and started to dry. 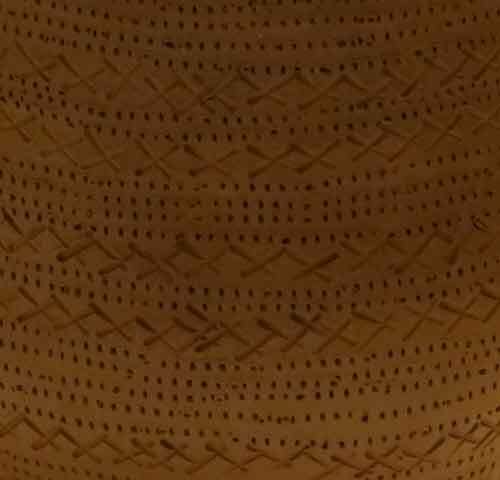 The decoration has been added by impressing a comb or clothes peg end to dent the clay - forming rings of pattern, copying the original designs. This is one of the No 1 beakers, just finished and ready to dry, he crosses were impressed with the clothes peg end. More images will appear here as the beakers are completed. Report on the Excavations at Wick Barrow, Stogursey, Somersetshire [Paperback] Harold Geo St. Gray (Author) -a modern copy of which can be purchased through Amazon. (1). Beaker found with Skeleton I. (Figured in Plate VII). This hand-made vessel, moulded into elegant shape, was found in many fragments with weathered edges, and was probably buried in association with the skeleton in an incomplete and fractured condition. Three-quarters of the pot were recovered, and it was possible to restore about two-thirds of it.“ The cup falls under Type Bl of the Hon. John Abercromby's classiﬁcation, and is a form chieﬂy found in the S.W. of Britain. In general outline it most closely resembles (1) the beaker found near Almer, Sturminster Marshall, Dorset,“ and (2) that found by General Pitt-Rivers in Barrow 20, Rushmore Park, Wilts; both now in Farnham Museum, North Dorset. Height of vessel, 6.25 inches ; ext. diam. at rim, 6.125ins ; max. ext. diam., 5.5 inches; diam of base, 3ins. ; max. thickness of ware, excluding base, 6mm. ; the substance of the clay is black, the inner and outer surfaces brick-red, of a smooth paste, without any apparent grains of quartz or sand in its composition; sharp-rimmed on the outer edge owing to bevelling; inside the rim are three irregular lines of impressions of plaited grass. All the line of ornamentation on the exterior are composed of rows of small oblong or square punctured dots. Horizontally arranged are four pairs of lattice bands consisting of crossed oblique parallel lines; each pair is divided by two rows of punch-marks, and the interspaces between the pairs of ornamental bands are filled up at regular intervals by rows of punch-marks which considerably overlap in places. Similar ornamentation, which is common, is seen on a beaker found in Barrow 7, at Sherburn, East Riding, now in the British Museum. (2) Beaker found with Skeleton II. (Figured in Plate VIII). 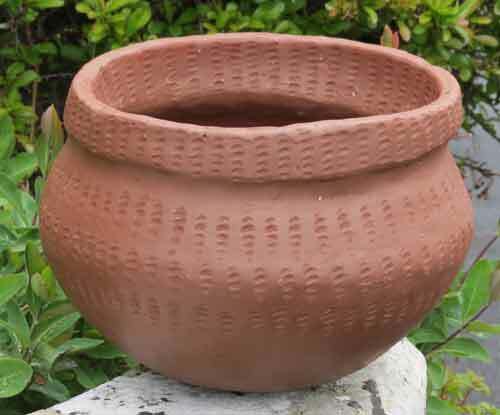 This hand-made pot was found broken only to an inconsiderable extent, and has been fully restored. As a type it is rather earlier than the beaker found with Skeleton I, and it falls under the heading of Type a2 of the Hon. J. Abercromby’s classiﬁcation. 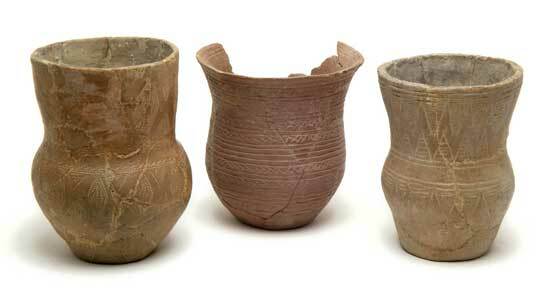 The four beakers found in association with ﬂint daggers mentioned on p. 31 belong to the very earliest type of ceramic art of the Bronze Age, viz., Type a1 of Mr. Abercromby, whilst the fifth example noted there was too fragmentary for restoration. The body of Beaker No. 2 is more or less globose, with a slight “shoulder” at the widest part. The height of the body is almost equal to that of the neck, at the base of which there is a constriction, but not so decided as in the case of Beaker No. 3. The neck is straight-sided, curving very slightly inwards at the lip. Height of the vessel 6.5 ins. ; ext. diam. at rim 4 15/16 ins, at base 3 1/16 ins., at bulge of the body of the vessel 4 5/8 ins. ; thickness of ware at the rim 7.5mm. ; the substance of the clay is brownish-black, the outer surface reddish-drab in colour, of a smooth paste like the other beakers. All the ornamentation is made up of lines of small rectangular punch-marks. The top of the rim is stamped with a zigzag pattern. 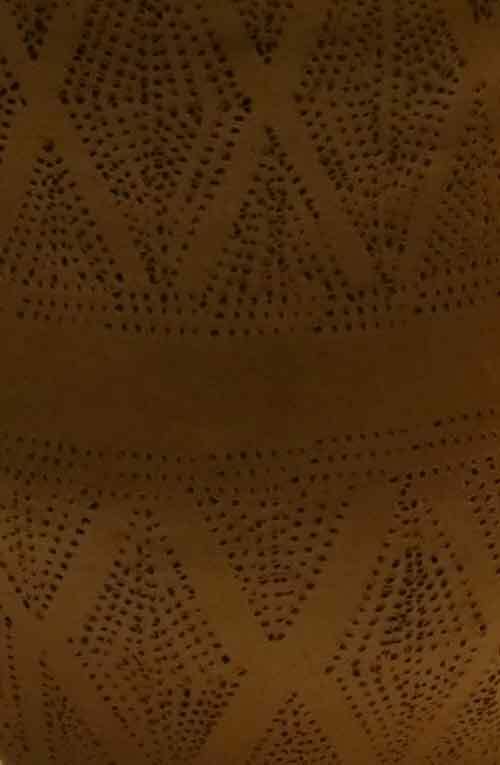 The whole external surface is covered with ornament, excepting the plain band encircling the vessel just below the constriction. 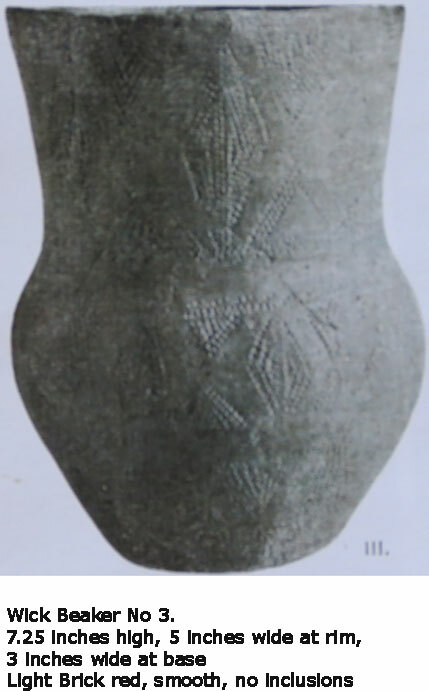 The design of ornament is of early type and consists, on both halves of the vessel, of two lines of interlocking triangles ﬁlled with horizontal lines parallel to the base, leaving a plain bar-chevron interspace, averaging 3/8 in. in width, between them, which together comprise a most effective and ambitious style of ornament. In some instances, in the lower half of the vessel, the triangles meet or nearly so, the inter-spaces presenting themselves sometimes as bar-chevrons, sometimes as bar-lozenges. Thus it is seen that the bands of triangles ﬁlled with lines parallel to the bases formed the chief motif of the decoration, the plain chevrons and lozenges being of secondary importance. 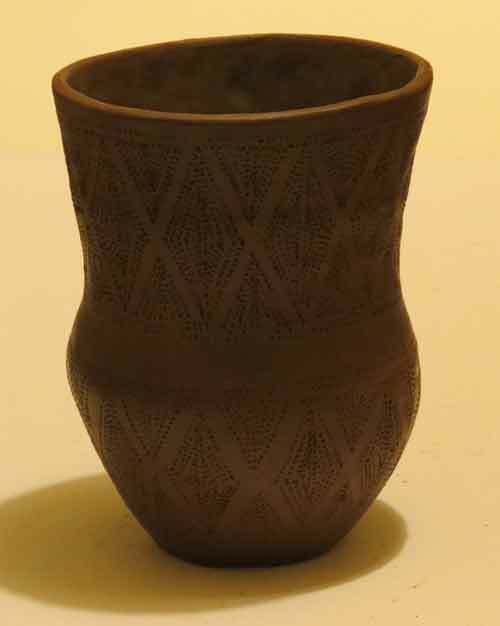 Chevron designs are common on early Bronze Age pottery, but the exact treatment displayed on this beaker is not precisely like anything that has been found previously, except in the case of the decoration on the neck of a beaker of similar form found by Mr. J. R. Mortimer in Barrow No. 4 of the Painsthorpe Wold Group, East Riding. Somewhat similar decoration is also seen on a beaker from Newhouse Farm, St. Fagan’s, Glamorgan, and now in the Cardiff Museum. (3) Beaker found with Skeleton III. (Figured in Plate VII). 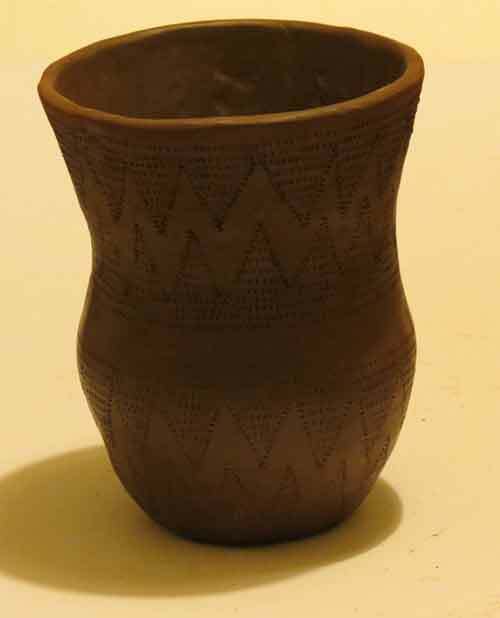 This beaker, also handmade, was found in many fragments, several of which had weathered edges as in the case of Beaker No. 1, from which it may reasonably be assumed that the vessel was buried in a fractured condition. 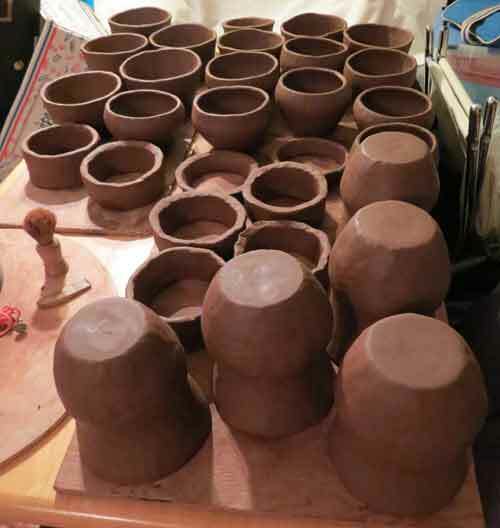 About ﬁve-sixths of the pot were recovered, and it was possible to restore about three-quarters of it, the deﬁciencies being made up with plaster of Paris. 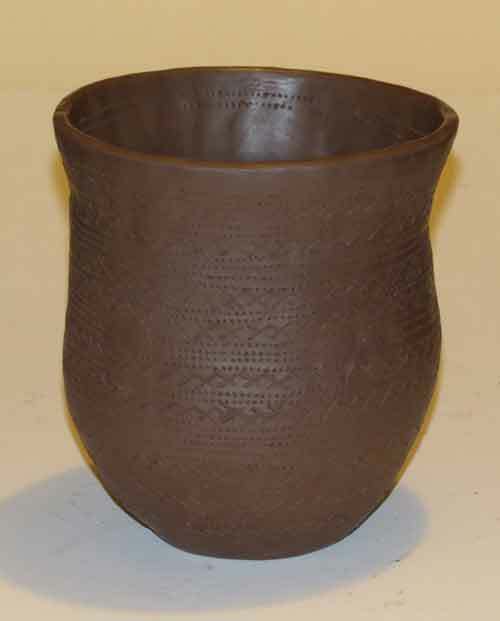 This vessel is larger than either of the other two found in the barrow, and is moreover of an entirely different type to Beaker No. l. Like the four beakers found in association with ﬂint knife-daggers mentioned on pp. 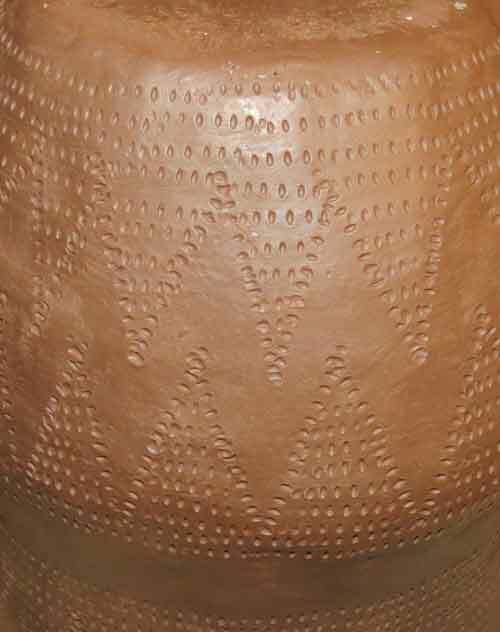 31, this example belongs to the very earliest type of Bronze Age pottery, viz., Type a1 of Mr. Abercromby’s classiﬁcation. The body of the vessel is decidedly globose, with a “shoulder" slightly indicated ; the height of the body is almost equal to that of the neck, and the constriction in the middle is more pronounced than usual. The sides of the neck are straight, but do not splay out so much as in the case of Beaker No. 2. Height of the Vessel 7.25ins. ; ext. diam. at rim 5ins., at base 2 7/8 ins., at bulge of the vessel 5 5/8 ins. ; thickness of ware at the rim 5.5 mm. The substance of the clay is black, the inner and outer surfaces being of a light brick red colour; of a smooth paste. Like the other beakers, this cup was polished on the surface by means of an implement of bone or stone, or by a hide pad. As in the cases of the other two beakers the ornamentation is entirely made up of quadrangular dots. At the constriction there is a plain band encircling the vessel, like Beaker No. 2, and there is another plain band just below the widest part of the body. Between these plain bands the three compartments of ornament are of precisely the same character, consisting of an upper row of triangles pointing downwards and a lower row pointing upwards, the interspaces between them being partly ﬁlled by lozenges at regular intervals apart. The bases of the triangles do not touch one another, as is more usual. The triangles and lozenges are ﬁlled with the little punch-marks; one of the triangles, however, seen clearly in the illustration, Plate VII, was never completely ﬁlled with the indentations. 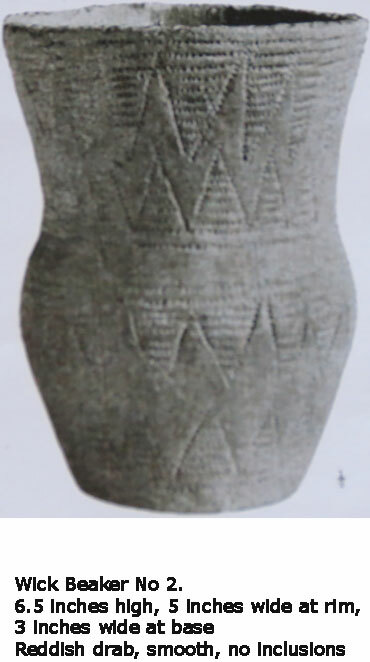 A somewhat similar design is seen on a beaker found in Sliper Low, Brassington Moor, Derbyshire, and another in Top Low, Swinscoe, Staffs, both of early type. The three beakers were restored by Mr. and Mrs. St. G. Gray. The Wick Barrow was excavated in 1907, the extract above is from the report produced then. There is quite a lot of mystery surrounding the barrow, also known as the Pixies Mound. Hopefully the little folk will be happy with this project!